fIcahn School of Medicine at Mount Sinai (G.R.-K.), New York, New York. BACKGROUND AND PURPOSE: A recent study using task-based fMRI demonstrated that the middle frontal gyrus is comparable with Broca's area in its ability to determine language laterality using a measure of verbal fluency. This study investigated whether the middle frontal gyrus can be used as an indicator for language-hemispheric dominance in patients with brain tumors using task-free resting-state fMRI. We hypothesized that no significant difference in language lateralization would occur between the middle frontal gyrus and Broca area and that the middle frontal gyrus can serve as a simple and reliable means of measuring language laterality. MATERIALS AND METHODS: Using resting-state fMRI, we compared the middle frontal gyrus with the Broca area in 51 patients with glial neoplasms for voxel activation, the language laterality index, and the effect of tumor grade on the laterality index. The laterality index derived by resting-state fMRI and task-based fMRI was compared in a subset of 40 patients. RESULTS: Voxel activations in the left middle frontal gyrus and left Broca area were positively correlated (r = 0.47, P < .001). Positive correlations were seen between the laterality index of the Broca area and middle frontal gyrus regions (r = 0.56, P < .0005). Twenty-seven of 40 patients (67.5%) showed concordance of the laterality index based on the Broca area using resting-state fMRI and the laterality index based on a language task. Thirty of 40 patients (75%) showed concordance of the laterality index based on the middle frontal gyrus using resting-state fMRI and the laterality index based on a language task. CONCLUSIONS: The middle frontal gyrus is comparable with the Broca area in its ability to determine hemispheric dominance for language using resting-state fMRI. Our results suggest the addition of resting-state fMRI of the middle frontal gyrus to the list of noninvasive modalities that could be used in patients with gliomas to evaluate hemispheric dominance of language before tumor resection. In patients who cannot participate in traditional task-based fMRI, resting-state fMRI offers a task-free alternate to presurgically map the eloquent cortex. To the best of our knowledge, no previous study has used rsfMRI to estimate language laterality using the MFG. The purpose of this study, therefore, was to investigate whether the MFG can be used as an indicator of language-hemisphere dominance in patients with brain tumors using paradigm-free resting-state fMRI. We hypothesized no significant difference in language lateralization between the MFG and BA and that the MFG can serve as a simple and reliable means of measuring language laterality. The study was approved by the institutional review board at Memorial Sloan Kettering Cancer Center. Fifty-one patients with brain tumors (age range, 22–78 years; mean, 51 ± 14.2 years; 31 men) referred for presurgical functional mapping by fMRI were included in this retrospective study. All patients were native English speakers and had no pre-existing language impairment per chart review. Handedness was determined by the Edinburgh Handedness Inventory with 47 patients determined to be right-handed and 4 determined to be left-handed. All patients had subsequent pathologically confirmed intra-axial primary glial tumors. Pathology revealed 20 low-grade (World Health Organization I and II) and 31 high-grade (World Health Organization III and IV) tumors. In 28 patients, the lesion was located in the left hemisphere (7 in the temporal lobe, 15 in the frontal lobe, and 6 in the parietal lobe). In 23 patients, the lesion was located in the right hemisphere (5 in the temporal lobe, 17 in the frontal lobe, and 1 in the parietal lobe). Each patient underwent resting-state fMRI as part of the routine presurgical work-up. Scanning was performed on 3T scanners (GE 750W Discovery, Milwaukee, Wisconsin) using an 24-channel head coil. For task-based and rsfMRI, T2*-weighted images were acquired with a single-shot gradient-echo echo-planar sequence in an axial orientation (TR/TE = 2500/30 ms, flip angle = 80°, slice thickness = 4 mm, FOV = 240 mm2, matrix = 64 × 64) covering the whole brain. 3D T1-weighted images were acquired with a spoiled gradient-recalled sequence (TR/TE = 22/4 ms, matrix = 256 × 256 matrix, flip angle = 30°, slice thickness = 1.5 mm). For the resting-state fMRI scan, patients were instructed to leave their eyes open, focus on looking at a crosshair, and not think about anything during the scan. A total of 160 volumes were acquired. Of the 51 patients included in the study, 40 also performed a silent word-generation task in the same session as part of presurgical language mapping. The language tasks were used to determine language laterality (right-dominant, left-dominant, or bihemispheric dominance) using methodology previously used by Dong et al,18 and the results were documented in the patients' final presurgical mapping report. In the current study, we implemented a data-processing scheme as outlined in Bharath et al.22 Data processing was based on SPM12 (http://www.fil.ion.ucl.ac.uk/spm/software/spm12/). In the first step, we discarded the first 5 time points from the functional MR imaging data to allow T1 relaxation. Next head-motion correction was performed to reduce the effect of within-scan head motion. During head-motion correction, we extracted the motion parameters, which describe the subject's motion in 6 different directions. Following motion correction, the subject's fMRI data were coregistered with the subject-specific anatomic images to improve normalization into Montreal Neurological Institute space. Following coregistration, we segmented each subject's anatomic images into gray matter, white matter, and CSF images. During the segmentation procedure, deformation fields were derived to transfer functional images into Montreal Neurological Institute standard space. We performed segmentation using the new segment procedures in SPM12. Each subject's segmentation maps were manually inspected to ensure successful segmentation. Finally, we used this subject-specific deformation field to transform the functional images into standard space images. In the next step, we implemented a linear regression to remove the effects of motion-related noise from the BOLD fMRI data. A general linear model–based regression approach was implemented using 24 motion regressors. This consisted of 6 motion parameters derived in the motion correction step, 6 squared of the original motion parameters, 6 one-time-points delayed version of the motion parameters and finally 6 squared of the delayed motion parameters. No regressors from the CSF or white matter region were included in the regression model. Following regression, residual data were derived and a temporal filtering between the frequency bands of 0.01 and 0.1 Hz was applied. Finally, 6-mm spatial smoothing was applied to the filtered fMRI data. 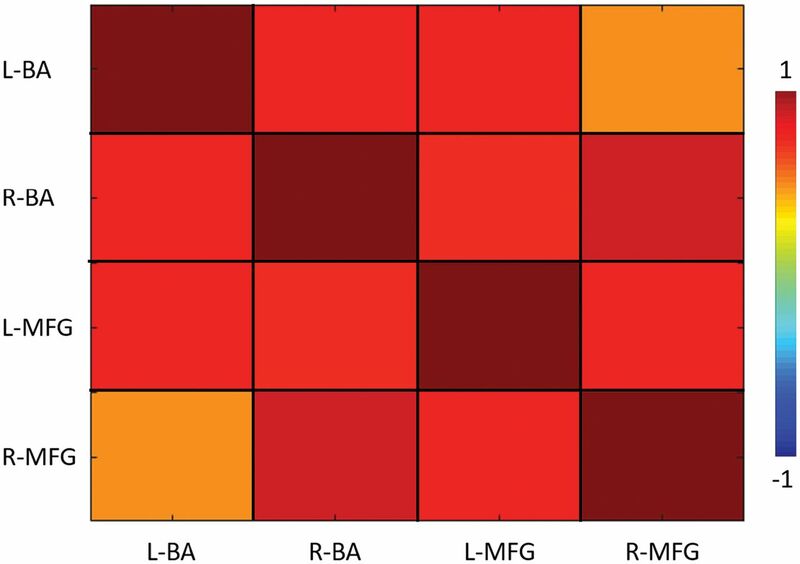 To identify active voxels in the BA and MFG regions, we implemented an independent component analysis (ICA)–based approach. In the first step, we performed a single-subject ICA on the filtered fMRI data. For each of the subjects, we performed a separate ICA and extracted 40 independent components. To identify ICAs representing the MFG and BA, we implemented a 2-step process. First, we calculated Dice coefficients between each of the independent components and the BA and MFG mask derived from the Harvard-Oxford Atlas.23,24 Next, we identified the top 5 independent components with the highest Dice coefficient. Each of these 5 independent components was then manually inspected using consensus viewing by 2 neuroradiologists with 4–15 years of fMRI experience to identify independent components representing the functional connectivity of the MFG and BA. After identifying these components, active voxels within the left MFG were calculated as the overlap between the independent component representing the MFG and the MFG region derived through the Harvard-Oxford atlas. The same process was repeated for the right MFG, as well as the left and right BAs to calculate the active voxels for each of the ROIs. Figure 1 illustrates the masks for BA and MFG regions, as well as independent components from a representative patient. The mean activated voxels in the MFG and BA were calculated for each patient. To account for differences in the size of MFG and BA masks, we divided active voxels by the number of voxels in the Harvard-Oxford atlas. We compared the ratio of active voxels using a paired t test. The possible relationship of voxel count between the left MFG and the left BA was shown using a scatterplot, and correlation was tested using the Pearson correlation analysis. For all statistical analyses, a significance level of .001 was used. A, Broca area and middle frontal gyrus masks overlaid on the Montreal Neurological Institute standard brain. B, ICA maps representing the BA network are overlaid on the BA/MFG masks for a representative subject. C, ICA maps representing the MFG network are overlaid on the BA/MFG masks for a representative subject. The laterality index (LI) for the MFG and BA was calculated using the standard LI formula2,7,25: LI = L − R / L + R, where L and R are the number of active voxels in given ROIs (MFG and BA) in the left and right hemispheres, respectively. The LI ranged from −1 (complete right dominance) to +1 (complete left dominance). Consistent with prior studies,26⇓–28 we defined right-hemispheric laterality as −1 ≤ LI < −0.2, bilaterality as −0.2 ≤ LI ≤ 0.2, and left-hemispheric language laterality as 0.2 < LI ≤ 1. In addition, we also calculated the functional connectivity between the MFG and BA ROIs. For each of the subjects, the filtered fMRI signal was extracted from the active voxels. The Pearson correlation coefficient was calculated between these time-series to derive functional connectivity between the MFG and BA ROIs. Tumors in each of the left and right hemispheres were categorized as high-grade (World Health Organization grades III and IV) or low-grade (World Health Organization grades I and II). For each hemisphere, LIs of the BA and MFG were compared between the high-grade and low-grade tumor groups. 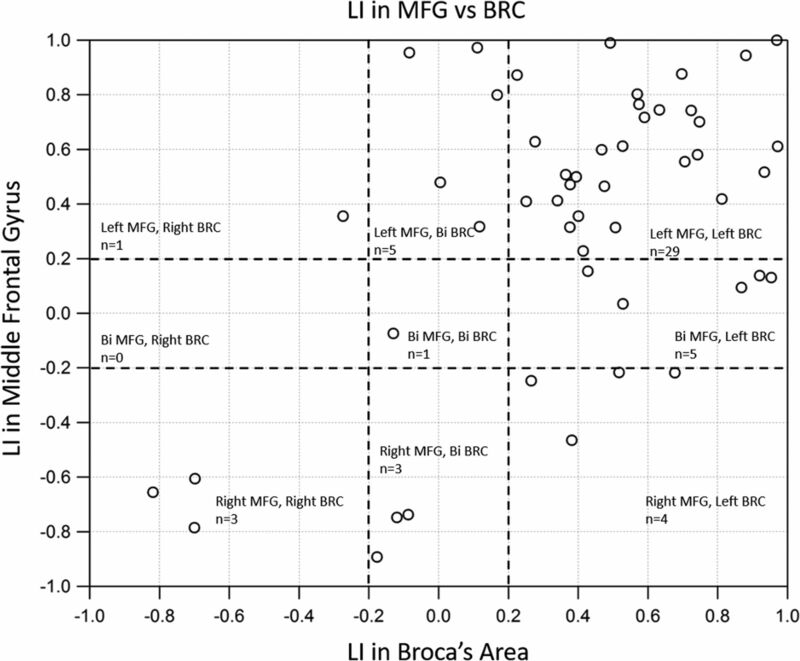 Differences in the LI of the BA and MFG between tumors in the left-versus-right hemisphere were also compared. LI differences were assessed using a 2-sample t test with the significance level set at <.05. Forty of the 51 patients included in this study had both rsfMRI and language task–based data obtained in the same session as part of presurgical language mapping. For each of these 40 patients, the LI of the MFG and BA based on rsfMRI was compared with the LI based on task-based fMRI so that a match (eg, left-versus-left) was scored as 100% accurate, while a mismatch (eg, left-versus-right) was scored as 0% accurate. In the first step, we compared the number of active voxels between the left BA and left MFG regions. The scatterplot between the number of active voxels for the left BA and the left middle frontal gyrus is shown in Fig 2. We observed significant correlation for the number of active voxels between the left MFG and left BA (r = 0.47, P < .001). The number of active voxels was found to be significantly higher in the MFG regions (376.92) compared with the BA regions (218.09); however, when we corrected for the size of the MFG and BA masks, these differences were not statistically significant. Similarly, a significantly higher number of voxels was found in the right MFG region (218.09) compared with the right BA region (99.35); however, these differences were also not significant when correcting for the size of the MFG and BA masks (Fig 2). Scatterplot between the percentage of BA voxels and the percentage of middle frontal gyrus voxels across participants. 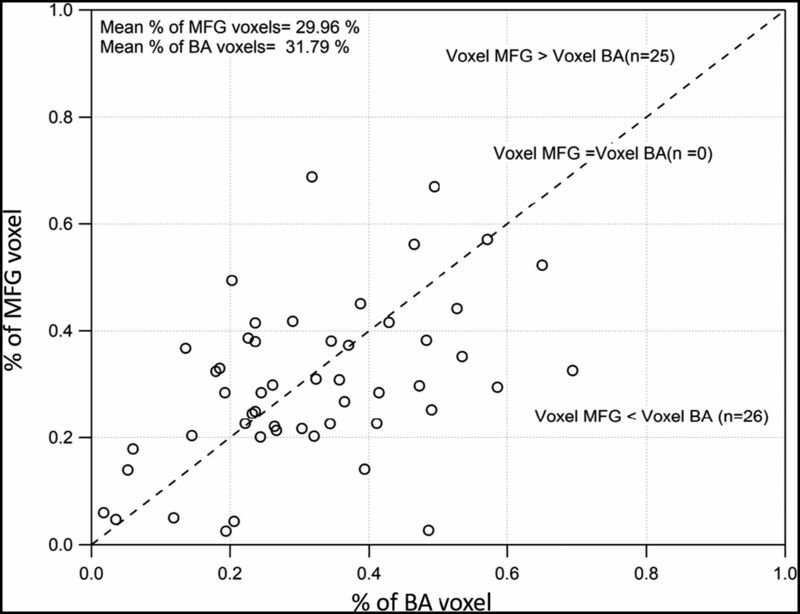 Significant correlation was observed between the percentage of MFG and BA voxels across patients. On the basis of the values for the number of active voxels, we calculated laterality indices for both the MFG and BA regions. Figure 3 shows the LI for each of the subjects calculated using these active voxels. We observed significant correlation (r = 0.56, P < .0005) between the LI of the BA and the LI of the MFG regions. As evident from Fig 3, many patients were identified as left-lateralized for both the MFG and BA, while only 3 patients were found to be right-lateralized in both groups. Scatterplot of the LIs in the middle frontal gyrus versus the BA. A significant positive correlation was observed between the LI of MFG and BA regions. We observed significantly higher functional connectivity between the left and right BAs and the left MFG, while the functional connectivity between the left BA regions and the right MFG was the lowest. Significantly high functional connectivity between right BA regions and the right MFG was noted. Figure 4 depicts group-level functional connectivity between the BA and the MFG regions. Group-level functional connectivity between the bilateral BA and MFG regions across patients. Positive functional connectivity was observed between the bilateral BA and bilateral MFG regions. In patients with tumors in the left hemisphere, the mean LI in the MFG was 0.06 ± 0.50 for low-grade tumors and 0.26 ± 0.52 for high-grade tumors (P = .3577, two-sample t test), while the mean LI in the BA was 0.26 ± 0.45 for low-grade tumors and 0.30 ± 0.47 for high-grade tumors (P = .8383, two-sample t test). For right-hemisphere tumors, the mean LI in the MFG was 0.38 ± 0.60 for low-grade tumors and 0.58 ± 0.33 for high-grade tumors (P = .3353, two-sample t test), while the mean LI in the BA was 0.56 ± 0.37 for low-grade tumors and 0.43 ± 0.35 for high-grade tumors (P = .3917, two-sample t test). Tumor location in the left-versus-right hemisphere regardless of grade did not significantly contribute to the LI in both the BA and MFG. The mean LI in the BA for left-hemisphere tumors was 0.29 ± 0.46, and 0.49 ± 0.36 for right-hemisphere tumors (P = .09, two-sample t test). The mean LI in the MFG for left-hemisphere tumors was 0.19 ± 0.52, and 0.48 ± 0.49 for right-hemisphere tumors (P = .04, two-sample t test). However, tumor location in the left hemisphere (frontal-versus-nonfrontal) contributed to differences in the LI in the BA and MFG. The mean LI in the BA for left-frontal tumors was 0.12 ± 0.53, and 0.47 ± 0.28 for left nonfrontal tumors (P = .0472, two-sample t test). The mean LI of the MFG for left-frontal tumors was −0.02 ± 0.49, and 0.44 ± 0.42 for left nonfrontal tumors (P = .0113, 2- sample t test). Tumor location in the right hemisphere (frontal-versus-nonfrontal) also contributed to differences in the LI in the BA but not in the MFG. The mean LI in the BA for right frontal tumors was 0.58 ± 0.26, and 0.14 ± 0.47 for right nonfrontal tumors (P = .0119, two-sample t test). The mean LI in the MFG for right-frontal tumors was 0.56 ± 0.37, and 0.18 ± 0.74 for right nonfrontal tumors (P = .12, two-sample t test). To derive the reliability of the laterality index through resting-state fMRI, we directly compared it with the task-based laterality index. We observed overlap between the laterality index derived from rsfMRI and task-based fMRI. Specifically, when we derived the LI on the basis of the BA using rsfMRI, 27/40 patients (67.5%) showed concordance with the laterality index based on a silent word-generation task. Similarly, when we derived the LI using the MFG and rsfMRI, 30/40 patients (75%) showed concordance with the laterality index based on a silent word-generation task. This study is the first to demonstrate that the MFG is a reliable means of lateralizing language networks using rsfMRI in patients with brain tumors. Our study demonstrated that voxel activation in the MFG correlated with that in the BA. Similarly, the LIs in the MFG correlated with LIs in the BA so that the greater the LI in the BA, the greater it was in the MFG. While the MFG had a slightly higher average LI than the BA, we found no statistically significant differences in language lateralization between the MFG and BA. Most important, LIs calculated from rsfMRI showed significant overlap with the LI determined from task-based fMRI. Although the MFG is a well-known secondary language area,29⇓–31 research characterizing its exact role in presurgical mapping is limited.11,12,14,32,33 In a study of patients with temporal lobe epilepsy, Lehericy et al4 demonstrated that asymmetric activation in the MFG correlated with hemispheric-dominance determination based on Wada testing. 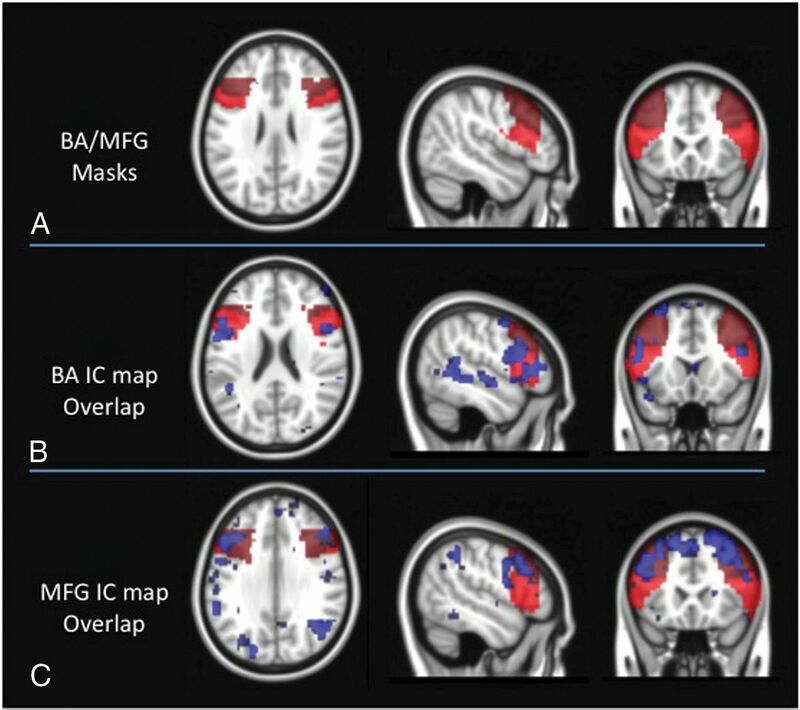 Task-based fMRI has shown similar activation patterns of the MFG in patients with brain tumors who were provided language tasks.20,21 The results of our study support these prior findings and suggest that the MFG can be used as an additional indicator in determining language-hemispheric dominance in clinically difficult cases in which a brain tumor could result in false-negative activation in the BA. In contrast to prior studies that used task-based paradigms to study the MFG, this study provided a comparative measure of the utility of the MFG relative to the BA in determining language lateralization using task-free resting-state fMRI. In those patients with significant physical or cognitive deficits, performing a task can be challenging; rsfMRI has risen as a promising alternate. This study adds to the growing body of evidence that suggests that rsfMRI can be potentially useful for presurgical mapping of eloquent cortices.5,34⇓⇓⇓⇓⇓⇓⇓–42 Furthermore, in contrast to prior studies that have used a priori seed-based methods for presurgical mapping of language functions with rsfMRI, this study uses a model-free ICA approach that avoided some of the pitfalls of seed-based analysis, including subjective expertise in seed placement. Some limitations to this study merit further research. First, the sample size was small, especially in terms of patients with atypical or right-sided language laterality. Second, although we excluded patients with an operation, we acknowledge that this method may not be generalizable to patients after surgery or patients with major structural lesions that may affect the consistency of standardized anatomic templates. Third, we used a model-free ICA approach; specific parameters such as the number of ICA components could have influenced the results of ICA-based functional MR imaging analyses. Before surgery, it is important to map the eloquent areas close to a tumor to avoid damaging those areas. Generally, direct cortical stimulation has been the method of choice for making this assessment, but it is limited to detecting mainly the cortical surface areas. Moreover, direct cortical stimulation determination of language-hemisphere dominance is not perfect. There is no one method that can provide a completely accurate lateralization of language. Therefore, multiple modalities must be used to determine lateralization of language with as much accuracy and certainty as possible. This recommendation is especially important in cases in which lateralization based on the BA can be misleading and additional markers are needed. Our results suggest the addition of rsfMRI of the MFG to the list of noninvasive modalities that could be used in patients with gliomas to evaluate hemispheric dominance of language before tumor resection. Activation in the MFG parallels that in the BA in non-task-based rsfMRI assessing hemispheric dominance of language. Task-based and rsfMRI comparisons of the BA and MFG are similar. Therefore, clinical use of rsfMRI for language lateralization, specifically by assessing MFG activity, should be considered in patients with brain tumors. Disclosures: Suril Gohel—UNRELATED: Grants/Grants Pending: National Institutes of Health, Department of Defense. Maria Elena Laino—RELATED: Grant: National Institutes of Health/National Cancer Institute Cancer Center support grant P30 CA008748. * Andrei I. Holodny—RELATED: Grant: National Institutes of Health, Comments: National Institutes of Health–National Institute of Biomedical Imaging and Bioengineering 1R01EB022720–01 (H. Makse and A.I. Holodny, Multiple Principal Investigators), National Institutes of Health–National Cancer Institute 1 R21 CA220144–01 (A.I. Holodny and K. Peck, Multiple Principal Investigators), and subaward on U54 CA 137788 (T. Ahles, Principal Investigator)*; OTHER RELATIONSHIPS: President of fMRI Consulting, LLC, a purely educational entity. Behroze Vachha—RELATED: Grant: National Institutes of Health/National Cancer Institute Cancer Center support grant P30 CA008748, National Cancer Institute/National Institutes of Health award support number R25CA020449. * *Money paid to the institution. This research was funded, in part, through the National Institutes of Health/National Cancer Institute Cancer Center support grant P30 CA008748. Research reported in this study was also supported by the National Cancer Institute of the National Institutes of Health under award No. R25CA020449 and, in part, by a grant to Maria Elena Laino, Principal Investigator, from the Department of Radiology at Memorial Sloan Kettering Cancer Center for a European School of Radiology Visiting Scholarship in oncologic imaging.